This French Novelist and Playwright has inspired many. 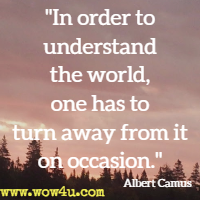 Browse these Albert Camus Quotes which are full of words of wisdom. It should also be noted the he won the Nobel Prize for Literature in 1957. 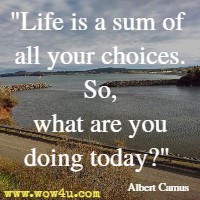 Life is a sum of all your choices. So, what are you doing today? Before, everyone was like me, and poverty seemed to be utterly natural in this world, but in high school, I learned about comparisons. 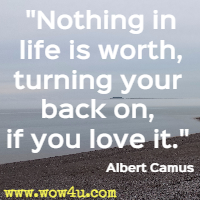 Nothing in life is worth, turning your back on, if you love it. Yes, there is beauty and there are the humiliated. 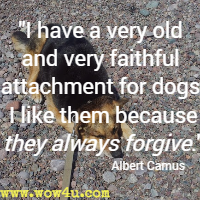 Whatever the difficulties the enterprise may present, I would like never to be unfaithful either to one or the other. 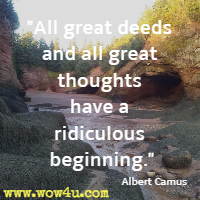 All great deeds and all great thoughts have a ridiculous beginning. 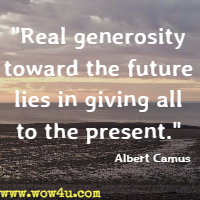 Great works are often born on a street corner or in a restaurant's revolving door."